Create a contact manually: ask for a visitor's contact information while chatting, and create the contact manually in your inbox. Email capture setting: after initiating a conversation, visitors will be prompted to enter an email address so you can follow up via email if they close out of the chat widget before you can reply. While chatting with a visitor, you can ask for their contact information and proceed to create them as a contact. In the left sidebar, click a chat conversation to open it. In the right panel, click Associate visitor. In the dialog box, enter your visitor's email address. If a contact is found in your database with a matching email address, you can click Yes, associate to associate your visitor with the existing contact. If the visitor doesn't exist, enter their first name and last name, then click Create contact. Hover over the chatflow you want to customize the email capture message for and click Edit. In the Email capture message field, enter your message. 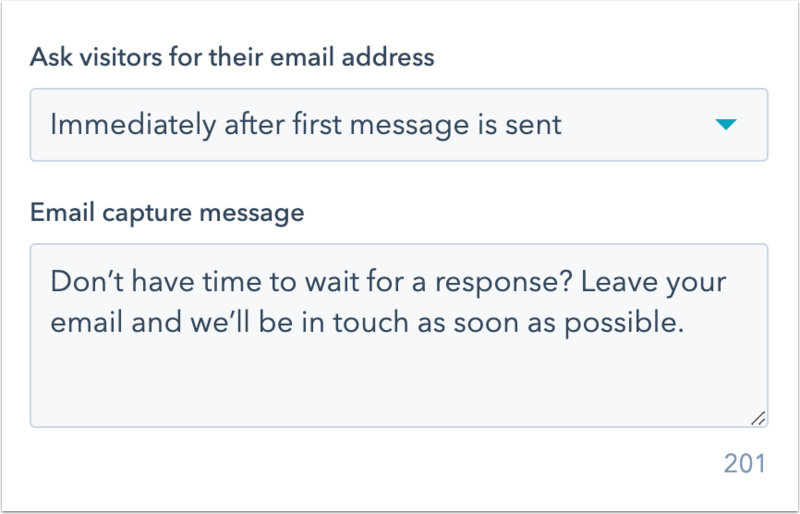 With the Email capture setting enabled, a visitor will see a prompt to enter their email address either right after the chat is sent or after a minute with no response. If they enter their email address and click the send icon send, they'll be created as a contact. 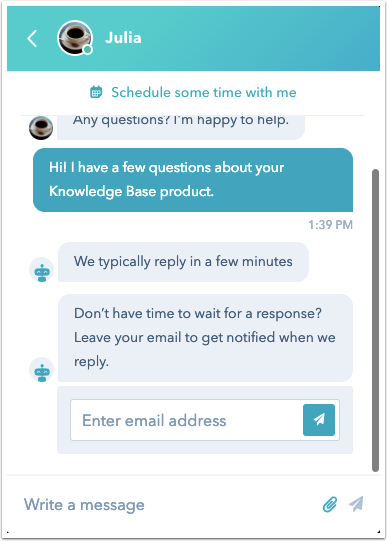 Please note: if the chat launcher is set to display an away message, a default email capture message will display instead of the custom Email capture message in your message settings. Can a contact be created automatically via live chat? 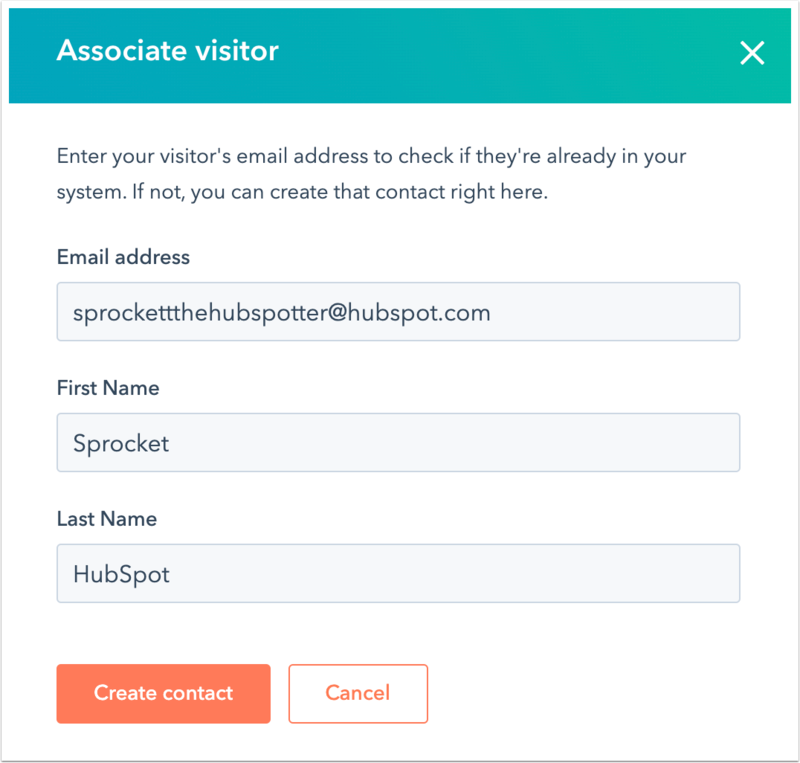 Visitors cannot be added to your HubSpot contacts database automatically simply by starting a chat. They're still associated with an anonymous tracking cookie until you receive either an email address from them or manually add them as a contact. If a visitor leaves your site before they're added as a contact, they will still have a unique cookie associated with their browser. If a visitor you have previously chatted with later returns to your site in the same cookied browser, the chat widget will load their conversation history. If the same visitor returns to your site after deleting their browser cookies or on a different device, the cookie will not be the same and their conversation history will not be loaded.